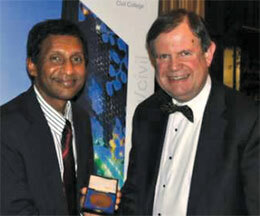 Professor Buddhima Indraratna, a leading expert in geotechnical engineering, renowned for his pioneering contribution to the conceptualisation and design innovation in ground improvement for civil and transportation infrastructure, and who has been earlier honoured with the highest accolade in Australian Geotechnical Practice - the EH Davis Memorial Lecture Award, and the Vice-Chancellor's Award for Outstanding Research has been conferred the double honour of the award of the 2011 Engineers Australia Transport Medal and the induction as a Fellow of the Academy of Technological Sciences and Engineering (ATSE). Prof. Indraratna is the Head of the School of Civil, Mining and Environmental Engineering of the University of Wollongong (UOW) and Director of the Centre for Geomechanics and Railway Engineering and a program leader of the Australian Research Council (ARC) Centre of Excellence in Geotechnical Science and Engineering. His contribution to research and practice in new rail track design methods to improve the safety of rail transport has been well recognised and have been applied in several areas in Australia. He has also launche novel solutions to control acid soils which, for example, have saved several millions of dollars of damage to agriculture and aquaculture in the Shoalhaven floodplain of Australia. He is the first academic of the School to have been honoured as a Fellow of ATSE.